As they say, life never stops. One of the consequences of the dispute over Jammu and Kashmir is a smokescreen especially around the Valley, through which all that is visible is the conflict, subsuming every aspect of everyday life. So what does the raging violence hide about life in Kashmir? A regular at bodybuilding competitions, Ali said he would be going to Thailand for another contest next month. “I am proud of what I do,” he said. Four kilometres from Tagore Hall, on Boulevard Road, is Winterfell Cafe. ­Saqib Mir, the 34-year-old proprietor of La Delice bakery, better known as “French bakery”, was talking about his experience of doing business in Srinagar. Listening to him were other young entrepreneurs, academics from Kashmir University, social scientists and government officials, who had assembled to brainstorm on how to generate employment for young Kashmiris. Mir spoke about the dismal economic scenario in the Valley. “We are doing quite badly on the economic front. There is no professional training in Kashmir. The work culture here is slow. We train people and they leave. That’s not efficient at all,” he said. More than the conflict, it is the laidback work culture that seems to worry him. And yet, he admits it was the conflict that had spurred him to leave Srinagar and fly to France when he was 18. “Like film ­festivals on the rubble of homes in ­Gaza, our smiles, our ­business—that’s our resilience,” says a Srinagar cafe owner. Like many other Kashmiris living abroad, Mir had been yearning to return to the Valley since finishing a diploma in baking from a reputed institute in Paris. It was only in 2014, though, after he had married a French woman and had two children, that he could set foot in Srinagar again, leaving behind the bakery and handicrafts store he owned in France. “I want my children to grow up in Kashmir because of our rich culture. That’s the reason we are here,” he said. Mir found a place with a great view of the Dal lake to set up his bakery. But not long after Le Delice started business, the machines were damaged in the 2014 floods. The bakery was reopened last year, but the long protest strikes called by Hurriyat Conference after the killing of Hizbul Mujahideen commander Burhan Wani forced Mir to close down La Delice again. Now it is back in business. Acknowledging the pathetic ignorance about Kashmir among most non-Kashmiris, she said, “In Haryana, I was told Lal Chowk is so named because there is too much blood. I was shocked to hear that. I also heard that grenades are so common in Kashmir, buying one is like buying eggs. 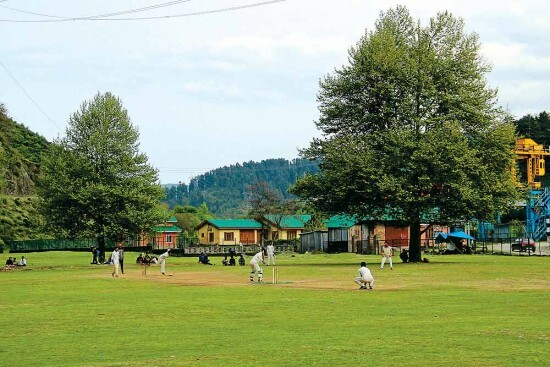 There is really a big chasm in the discourse on Kashmir and, therefore, a need for bridges to understand what the reality is.” For decades, Lal Chowk has been a nerve centre of political and economic activities in the Valley. Named after Moscow’s Red Square by some communists in Srinagar, who thought of it after the Bolsheviks seized power in Russia in 1917, life moves on in Lal Chowk as well. “The tragedy is that people outside Kashmir don’t know that Kashmiri society has not broken down or become dysfunctional despite the prolonged insurgency, but has adapted to it rather well,” said Sumantra Bose, professor of international and comparative politics at the London School of Economics, in his lecture at the Central University of Kashmir earlier this month.